The Road Glide® Ultra motorcycle brings the Road Glide motorcycle back to the Harley® touring lineup with maximum swagger, custom CVO™ style and long mile capability. Project RUSHMORE - Control: Here are some of the innovations Project RUSHMORE led to: the Reflex™ Linked Brakes with ABS, the dual Daymaker™ Reflector LED headlamps, brighter Tour-Pak® luggage carrier lighting, brighter turn signals, brighter brake lights, and a steering head with stiffer front forks. Locked-up tires are now history even when there’s wet pavement. We’ve made it feel even better to lean your way through a turn. Now you can see better. And we’ve made you more conspicuous to the cage-driving public. Because one thing we all agree on is this: bikes that work better make riders who ride better. Take a ride. See how good you can be. Steering Head and Front Forks: Whether it’s a big sweeping curve or a set of tight turns, a Project RUSHMORE motorcycle feels rock-solid in the corners. We stiffened up the front end, increased the fork diameter to 49 mm (an increase of 18%) and re-tuned the damping for a smoother ride. The responsiveness is dialed in. Ergonomically Designed Hand Controls: It’s hard to enjoy the ride or keep your eyes focused on what’s coming down the road when you’re fussing and bothering with the switches on your handlebar. So we’ve worked over the hand controls on our touring bikes with as much passion as we’ve worked over our engine. We made the shape more ergonomic and located and angled them to fall right under your thumbs. We’ve added left-hand cruise for easy activation, toggle switches to control infotainment functions, and an easily locatable trip trigger switch to control and scan through functional readouts. And we’ve improved the feel to give you a confidence-inspiring click at every push of a button. Even the dash panel switch gets better. And it’s all prewired for parts and accessories, which even lets you customize with less fuss and bother. Reflex Linked Brakes with ABS: No doubt about it, there are times when you need to haul things down in a hurry. And you don’t get to pick those times. Or decide whether or not they occur when you’re on a flat, smooth, dry, perfect stretch of pavement. That’s why our touring models feature the Reflex Linked Brakes with ABS. ABS turns a locked-up front wheel or a rear wheel skid into a relic from riding’s history. And the front and rear brakes are electronically linked to provide exactly the right amount of brake to each tire no matter what the road condition is. No matter how good you are, this will make you a better rider. New Dual Daymaker Reflector LED Headlamps: Here are the stats: 85% more spread and 6% more punch on low beam, 35% more spread and 45% more punch on high beam. These are the numbers. What they translate to on the road is not feeling like it's time to park the bike when the sun goes down. Dunlop® Multi-Tread™ Blackwall Tires: The 180 mm back tire is engineered to do more than fill out the rear fender and put a bigger patch of rubber on the road. Dunlop Multi-Tread technology uses harder compounds at the center and softer on the sides for a tire that still knows how to knuckle down on corners. Perfect for making this bike agile on every curvy stretch of road. And the way it feels going through an abrupt off-camber turn will put a grin on your face that'll last to the next state line. H-D® Smart Security System with Hands-Free Fob: The factory-installed next-generation security system features a hands-free fob that automatically arms and disarms the vehicle's electronic security functions as you approach and walk away from the bike. Stick the fob on your ignition key ring and let it do all the work. It's this attention to detail and security that makes Harley-Davidson® motorcycles unique. Twin-Cooled™ Cooled Twin Cam 110™ Engine Heritage: The knowledge of what makes an engine truly move a rider runs deep at The Motor Company, and it was put to good use when we created the Twin-Cooled Twin Cam 110 engine. We sweated bullets perfecting every cubic inch, pushing design and technology forward. This engine gives you at or near peak performance in all temperatures and operating conditions thanks to air and precision-cooled technology. And we did it all without compromising one bit of Harley-Davidson's unique styling. Evolved, yet carrying on the legacy of the Flathead, Knucklehead, Panhead, Shovelhead, Evolution® and Twin Cam 88® engines and Twin Cam 96™ engines that came before. The performance and durability are a direct result of the untold miles logged on the V-twin since 1909 and the proud heritage that comes from a century's worth of commitment to life on two wheels. Twin-Cooled Twin Cam 110 Engine Innovation: Fire up the Twin-Cooled Twin Cam 110 engine and feel the low-end torque unleashed. Thanks to the lightweight piston design, delivery of the added power is more refined than ever. Ease out the rock-solid hydraulic clutch and feel how the engine and Six-Speed Cruise Drive® transmission were designed to work together. Six speeds. A strong driveline and strong internal parts. Low routine maintenance. And a low cruising RPM couldn't feel better. Twin-Cooled High Output Twin Cam 110 Engine: If you started in 1909 with the very first Harley-Davidson V-twin engine and worked your way up through every engine, every innovation, every improvement, every ride, every durability test in all those years and countless miles since, you arrive at the Twin-Cooled High Output Twin Cam 110 engine. This is the top of the line. 110 cubic inches of air and precision cooled Harley-Davidson V-twin. Twin cooling cools the heads around the exhaust ports to deliver at or near peak performance under all operating conditions and temperatures. A higher compression ratio increases efficiency and horsepower. There’s an airbox for increased airflow and a redesigned cam to optimize low-end torque. It’s got the fastest 60 to 80 mph 5th gear roll on in the history of Harley-Davidson. Which means it’s got the most passing power in the history of Harley-Davidson. On top of all that, it puts less heat on the rider and passenger on scorching days and in stop-and-go traffic. Six-Speed Cruise Drive Transmission: You want a ride that rumbles—not begs for mercy—when you lean on it a little. The Six-Speed Cruise Drive transmission provides smooth, quiet shifting and reduces engine speed on the highway, so you get a better match between engine turnover and road speed. And the Isolated Drive System makes acceleration flow in a smooth, steady stream from your wrist right down to the pavement. It's a rare ride when a bike responds like this, and a low growl goes a long way when you're opening up the road ahead. New Handlebar: There's a new handlebar on the CVO Road Glide Ultra motorcycle this year that makes the riding position more comfortable for a wider range of riders. The hand grips are now 5.5 inches closer to the rider. It means no long stretch to reach the bars, and you can sit in a more upright position. Adjustable Air Ride Rear Suspension: The new CVO Road Glide Ultra model gives you our premium adjustable air ride rear suspension. New Fairing Design Reduces Head Buffeting: Over the years, riders of the Road Glide Ultra motorcycle have put in more miles behind its fairing than you could count with a supercomputer. Its fatigue-reducing fixed frame design has made the Road Glide motorcycle the choice of those who live to ride the big miles. It was good, but on the CVO Road Glide Ultra model it gets amazing. We went into the wind tunnel and out on the road to build the next Road Glide fairing. When you experience what we came back with, you're simply not going to believe the ride. No fairing in the history of motorcycling has ever cut through the wind like this one does. It's got triple splitstream vents that open and close to equalize pressure in front and behind the windscreen. In head-buffeting tests, it beats every other motorcycle on the road. Hands down. You've never experienced a ride like this. And that's what Project RUSHMORE was all about. Increased Passenger Seat Space and Legroom: Here's a message for all passengers: your time in the saddle has never been better. That goes quadruple when you’re 1,000 miles into the ride of a lifetime making the final leg of the day to get to the hot tub so you can relax for the evening. Because the longer the ride, the more you'll appreciate the improvements we made when we introduced the Project RUSHMORE motorcycles last year. The passenger pillion is one inch wider and one inch longer. And we put two more inches of room between the speakers. We moved the saddlebag guards down for more legroom and to make sure they don’t rub your calves. It all adds up to a ride that provides best-in-class comfort. Heated Hand Grips: When the chill gets at you, just having a little heat would be nice enough. But this is a Harley-Davidson motorcycle and we're all about the details. Our heated handgrips have six settings, so you can easily adjust on the fly for the heat you need with the versatility and control you've come to depend on. Full-Length Footboards and Toe/Heel Gear Shifts: Your boots were made for riding—any way you see fit. Our full-length footboards boast a time-tested, tried-and-true design and rubber isolation for a comfortable ride, while the height-adjustable passenger boards add another level of customizable comfort for your riding partner. And for shifting gears, you can use either the traditional toe-shift or the even easier, more convenient heel-shift. It might take a few rides, but once you've gotten used to the smooth shifting rhythm, you'll never give it up. Project RUSHMORE - Convenience: If you want the ride to be truly epic, you have to sweat bullets to make the little things work exactly right. This is what Project RUSHMORE was all about. Now you have saddlebags that can be easily opened with one hand. Compartments that open with one touch. And we’ve increased the storage space on these machines without ruining the sleek, road-eating look of the bike. It all adds up to hundreds of little moments where things just click conveniently into place. Because there can be no imperfections in the quest for the perfect ride. High Output Accessory Connector: Touring means maximum comfort in all conditions and the capacity to add whatever enhances and personalizes your ride. The high output charging system provides an electrical capacity robust enough for your add-ons: heated vests, heated seats, heated handgrips, lights to showcase the engine, you name it. So if you're hell-bent on 2-wheeling it, we make sure you've got the juice to do it your way. Tour-Pak Luggage Carrier Design: Like the saddlebags, the Tour-Pak luggage carrier design sports a sleek look, but it didn’t come at the expense of storage space. They can easily accommodate two full-face helmets. There’s a document and tool kit pouch. The lock is integrated into the latch to keep your key away from your premium paint. And premium hinges that work better and look sharper. You can operate the single latch with one hand. Storage. Check. We have it covered. Saddlebag Design: Don’t let the sleek look of these saddlebags deceive you. The look is tight on the outside, but things just got a little roomier on the inside. You want stuffability and these deliver bigger than ever. The hinges are simple and clean and the lids open with one touch of one hand. The lock is tight and integrated into the latch where you can put the key in without the danger of scratching your premium paint. And removable travel bags are standard. Welcome to the next level of the bagger. Jukebox with USB Port For iPod / iPhone: The Jukebox opens easily and includes a USB connection which accepts your iPhone, iTouch, non-iPod imitators, and SD card and other USB compatible devices. Pop it open, plug in and your device becomes a part of your motorcycle. Ready to be operated by voice command or hand controls. BOOM! 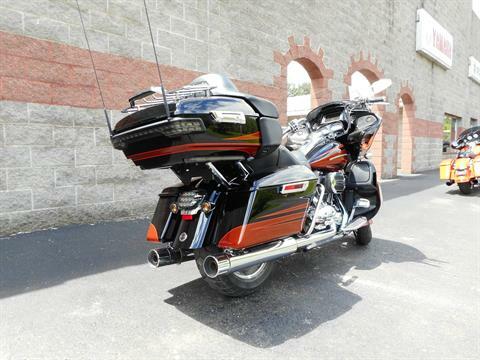 Audio SiriusXM® Satellite Radio: Even when you end up in places where radio towers don’t reach, your favorite music, sports, talk and news are along for the ride on the CVO™ Road Glide® Ultra model. BOOM! Audio SiriusXM radio gives you over 175 digital channels, and coverage from coast-to-coast. Which means you won’t hit that point where the signal starts to fade, the sound gets full of static and you have to start scanning for stations. Instead, you just keep enjoying the song and the ride. You can also sign up for additional specialty services through SiriusXM, like graphical weather overlay, forecast, traffic, and nearby fuel prices. You get all of these services at no additional charge for the first three months. After that, you can sign up for any or all of them through SiriusXM. BOOM! Audio is the ultimate. And this is the ultimate BOOM! Audio. 6.5-Inch Full-Color Touch Screen Display: This 6.5-inch full-color touch screen puts all your information in front of you bigger than ever. Modern graphics, colors you can dial in, and auto and manual dim. Designed to sit stylishly inside your fairing, it takes screen technology to an eye-popping level of Harley-Davidson functionality. This is more than you expect, but when you’re going all the way, it’s everything you deserve. BOOM! Box 6.5GT Radio: Let’s start with this. The BOOM! Box 6.5GT Radio puts out 75 watts per channel at 1% distortion and features a factory-tuned, optimized equalizer that pumps out more power and can be played louder while maintaining the clarity of your sound. And the speed tuning system delivers more than just volume changes at different speeds. It changes the level of bass and treble to dial in the best sound, whether you’re running at a stately pace down the strip or going hell for leather down an open stretch of road. How do you like the sound of a Harley® motorcycle? Project RUSHMORE - Styling: Project RUSHMORE is the journey we set out on to take our touring motorcycles to places never imagined before – to turn all the possibilities for what a motorcycle can be now into true Milwaukee steel. We did it our way, as we’ve always done. As riders. Riding with other riders. Thousands of hours, countless road tests, millions of miles. Looking for the technology and innovations that truly make the ride better. We went over the bike fender tip to fender tip. Making it work better. Making it look sleeker. Modern. Clean. Tight. Let your eye take the journey over the machine. This is classic Harley-Davidson style and a sleek, modern look at the exact same time. At Harley-Davidson, form has always followed function. And both have always reported to emotion. Now we’re just doing it on a completely different level. Pure Harley-Davidson Styling: Feast your eyes on the Twin-Cooled Twin Cam 110 engine and there's no mistaking its roots. This is authentic Harley-Davidson style through and through with an attention to detail you won't find from any other motorcycle company. It's a jewel machined out of metal. Pure. Dripping with power. From the classic edge of the cooling fins to the clean lines of cases and covers—the Twin Cam 110 engine makes an ironclad statement about holding on to what's right and staying true to what satisfies. Classic Fuel Tank: Part of the unmistakable style of the Harley-Davidson CVO Road Glide Ultra motorcycle is plenty of room for showing off your paint. This classically styled, bold 6-gallon fuel tank doesn't just give you a bigger canvas for premium or custom paint; it holds 6 gallons of go so you can eat up a lot more road between pit stops. We know fuel economy is important—but so is style. Sharp, eye-catching colors and precision-crafted Harley-Davidson tank medallions complete the unique look of this tough bagger. Exclusive CVO Motorcycle Enhancements: All the quality. All the legacy of the Harley-Davidson name. Plus custom touches and performance that distinguish you from every other bike on the road. Sure there's a little vanity. Premium custom. Big, tricked-out wheels. Deep attention to details. The perfect storm of engineering and style you'll only find on a custom machine. And you'll spoil yourself with the accessories—from comfort to electronics to chrome. But the real signature of a Harley-Davidson Custom Vehicle Operations™ motorcycle is the explosive power and sleek detailing of the huge Twin Cam 110 engine with Screamin' Eagle® engine badges. It's custom-built, not just for anyone, but for true connoisseurs of the road. High-Impact Paint and Graphics: Individually crafted and hand-finished paint and graphics come standard on all Harley-Davidson Custom Vehicle Operations motorcycles, balancing style and premium appeal to create one-of-a-kind custom motorcycle masterpieces. The CVO Road Glide Ultra model offers three exclusive color schemes: Abyss Blue / Crushed Sapphire, Burgundy Blaze / Typhoon Maroon and Carbon Dust / Autumn Sunset. Skimping? The word's simply not in our vocabulary. Airflow Collection Accessories: The CVO Road Glide Ultra motorcycle rolls off the line with a full complement of Airflow Collection accessories: rider footboard inserts, passenger footboard inserts, shifter pegs, brake pedal and cover, highway pegs, heated handgrips with rubber inserts, and shift lever arms. 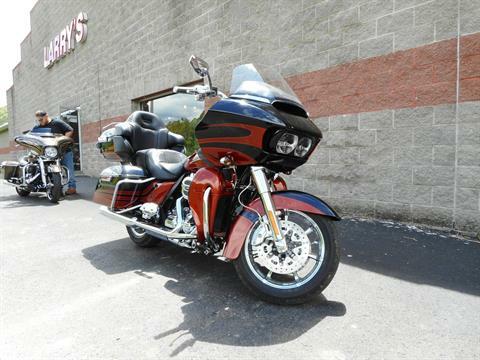 You want more and with the CVO Road Glide Ultra motorcycle, more is what you get. Restyled Fairing, Saddlebags, Tour-Pak Luggage Carrier and Front Fender: The Road Glide motorcycle is loved by die-hard road warriors all over the world for its distinctive, menacing, mile-hungry look. With Project RUSHMORE, we're turning the dial up to 11. We streamlined the outer fairing and gave it a more narrow profile and a more modern, aggressive style. We put new, clean trim on the windshield. We cut back the front fender to show off more of the wheel. And we restyled the saddlebags and Tour-Pak luggage carrier for a sleek, modern look (without sacrificing luggage space). The end result is a new take on the time-honored art of badass, road-eating motorcycle design. 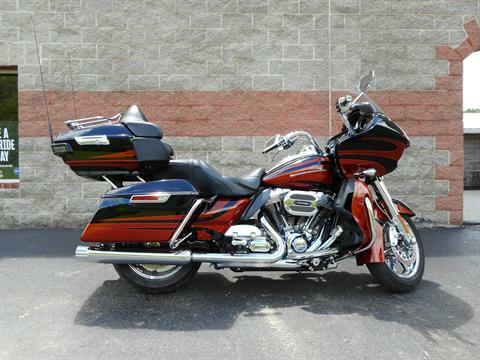 And the CVO Road Glide Ultra model takes it farther than it's ever gone. New Chrome Slicer Wheels with New 90-Degree Valve Stem: It's hard to take your eyes off the new Chrome Slicer wheels on the new CVO Road Glide Ultra motorcycle. But while you're looking them over, notice the new 90-degree valve stem. This machine even makes putting air in your tires better than it was before. New Color-Matched Inner Fairing: There's a lot to say about the inner fairing on the new CVO Road Glide Ultra motorcycle. It's color-matched to the paint on your bike. There's a diamond-cut fairing cap, dual storage compartments and silver-faced gauges. Give it a once-over and you'll also notice a bigger display screen and gauges that feature a 10% larger viewing area and wider, taller numbers. The information gets bigger and better too. There’s a gear indicator for all six gears, and the display area, which can now be operated by an extremely convenient trigger switch, puts more information at your fingertips. The temperature and fuel gauges are larger too. When you’re on the road, one quick glance tells you everything you need to know. Chrome Tank Console with CB Pod: A custom diamond-cut chrome tank console with a charcoal CB pod insert rides on top of the classic fuel tank of the CVO Road Glide Ultra motorcycle. This is the kind of finish you get when you forge a motorcycle in the blast furnace of uncompromising attitude. New 13.5-Inch Custom Windshield with Chrome Trim: The new CVO Road Glide Ultra motorcycle puts 13.5 inches of custom style trimmed in chrome between you and the world's flying insect population. New Perforated Seat and Matching Adjustable Backrest: There are other ways to cover a motorcycle seat. But they don't belong on a machine like the new CVO Road Glide Ultra motorcycle. There are perforations on the seat and a matching adjustable backrest for the passenger. Leave compromising to the politicians. Bullet Turn Signals: We went end to end and top to bottom to give the Harley-Davidson Touring lineup the clean, tight, sharp, iconic look and feel that only befits the next generation of our motorcycles. The finishing touch – bullet turn signals with smoked lenses and amber bulbs. Sleek and modern, yet a timeless classic. Combination Rear Stop / Turn / Taillights: The last thing people see when you go by on the CVO Road Glide Ultra motorcycle is the clean, custom look of combination rear stop / turn / taillights. You never get a second chance to make a last impression. Airbox with Tank Panel-Matching Insert: Our design philosophy can be summed up pretty simply: form follows function, but both report to emotion. This airbox is a prime example of that. Function? It lets the engine breathe better for more power, but it’s also designed to provide better airflow around the rider. Form? The design of the insert matches the tank panel. Emotion? That’s the part you feel when you look at it sitting right at the center of your V-twin engine.